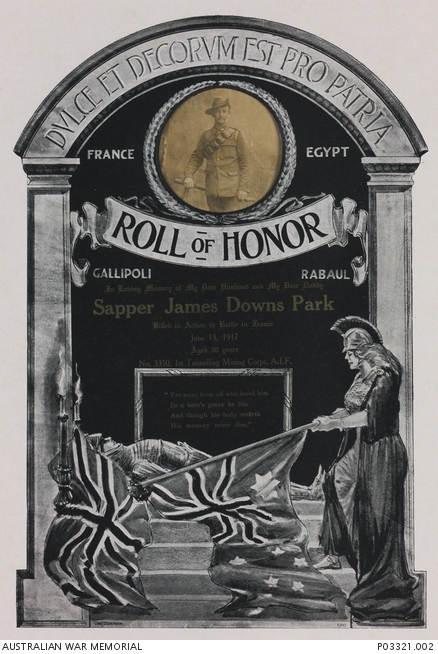 A photograph framed in an elaborate photolithographic memorial frame, commemorating 3350 Sapper (Spr) James Downs Park, 1st Australian Tunnelling Company, of Redfern, NSW. A boat maker in civilian life, Spr Park enlisted in Sydney on 10 January 1916 and later served on the Western Front. Spr Park was killed in action in France on 13 June 1917 aged 30 years, leaving a widow, Mrs Ada Nelson of Leichhardt, NSW and their children. Spr Park was buried in the Railway Dugouts Burial Ground (Transport Farm) Zillebeke, Belgium. This personal roll of honour reads “In Loving Memory of My Dear Husband and My Dear Daddy, Sapper James Downs Park, Killed in Action in Battle in France June 13, 1917, Aged 30 years, No. 3350, 1st Tunnelling Mining Corps, A.I.F. Far Away from all who loved him, In a hero’s grave he lies, And though his body resteth, His memory never dies”. The photolithographic frame was published in 1916 by WJ Dowman.